The influence that Italy has had on history, world culture and popular culture is immeasurable. 'Italy' evokes different things in different people. When I hear the word I picture Audrey Hepburn on her vespa in "Roman Holiday". I can visualise Robert De Niro giving Don Tommasino his 'just desserts' in "The Godfather". I can also see Roberto Baggio missing that penalty kick in the 1994 World Cup. However, I am sure we can all see the cuisine. Ah, the food. Italian cuisine has found a new home in Abu Dhabi. 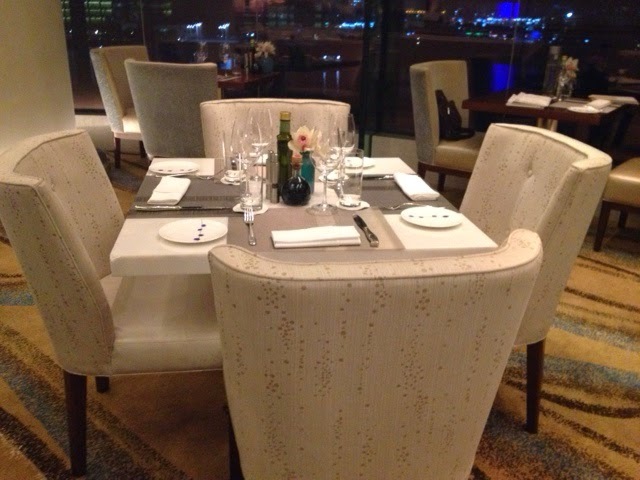 And that is at the gorgeous Aqua restaurant in the Rosewood Hotel on Al Maryah Island. 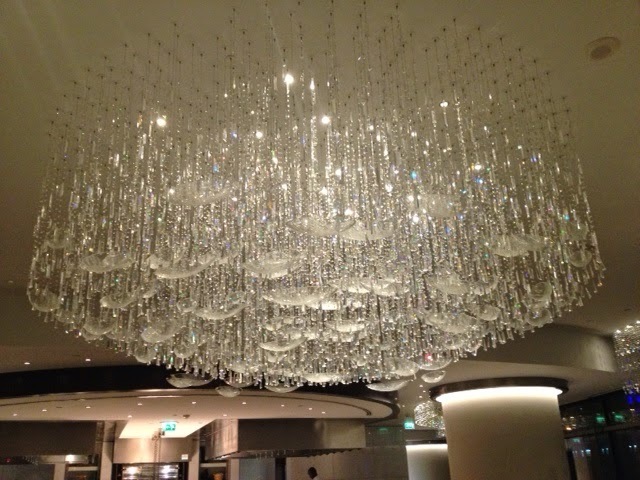 The chandeliers are simply breathtaking. Part of the interesting seating options - bar style depicted here. Aqua, aptly named because the hotel is mostly surrounded by water, and the floor to ceiling windows afford one 180° views of the surroundings. The restaurant has magnificent chandeliers, recalling the shape of a wave or even a meandering stream, reinforcing the name Aqua. The restaurant is light and bright with no heavy colours to overpower one. White or off-white is the dominating colour theme. However, it is not a clinical white. It is quite warm. The menus, also in white, are simple and not daunting. I am reminded of the expression that the essence of beauty is simplicity. 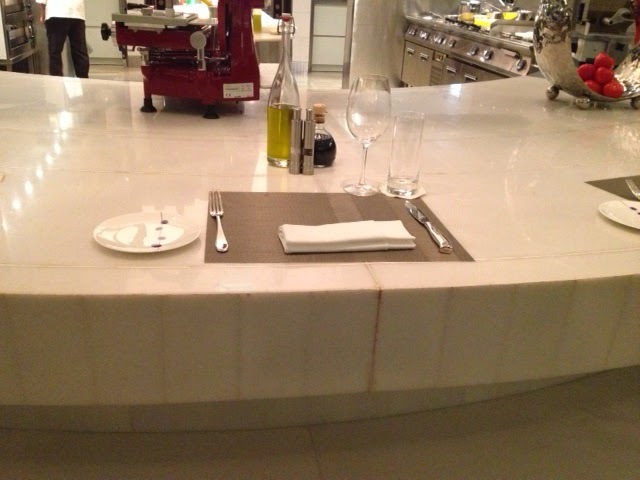 In a previous post on Boca at The Hilton, I also commented on the simple nature of its menu - http://mitsukiemma.blogspot.ae/2014/02/bocca-hilton-abu-dhabi.html. My waitress for the evening immediately showed herself to be adept at dealing with guests and exuded a quiet, calm confidence as she recommended my starter - an assortment of mozzarella tastes, Mozzarella Di Campagnia tasting. While the meat options looked simply inviting, I went with the pasta. Aqua, after all, is an Italian restaurant. So, I ordered the slow braised oxtail agnolotti. However, Chef Harris must have sensed my curiosity and invited me to try an added dish if I was so inclined. 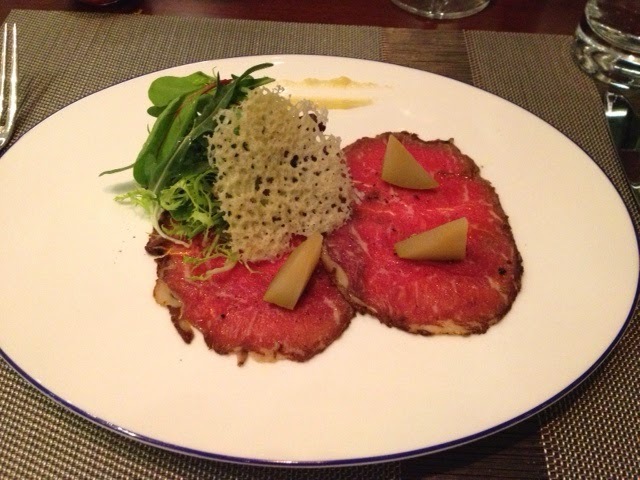 I therefore chose the smoked beef carpaccio. Before my starter, I was offered an amuse bouche which was a deep fried ball of cheese on a lemon base. In addition to this, there was an excellent small bread basket with olive paste and olives. As good as all of these were, nothing could have prepared me for the mozzarella tasting platter. Chef Harris believes that the mozzarella caprese salad is a ubiquitous menu item in Italian restaurants, so he wanted to create something that brought together tradition and the contemporary - hence this mozzarella dish. 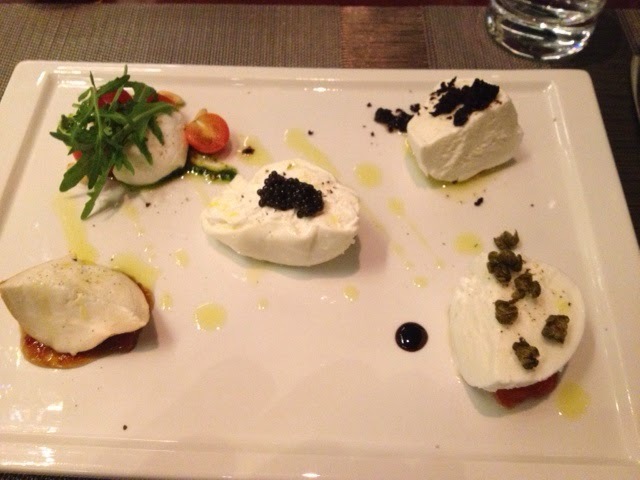 There are five different types of mozzarella: The burrata with caviar, the smoked mozzarella in lemon chutney, mozzarella caprese with pine nuts and pesto, fresh mozzarella with dehydrated oilves and buffalo mozzarella with fried capers and tomato marmalade - as I write this I am reliving the tastes. My favorite? That's an unfair question. 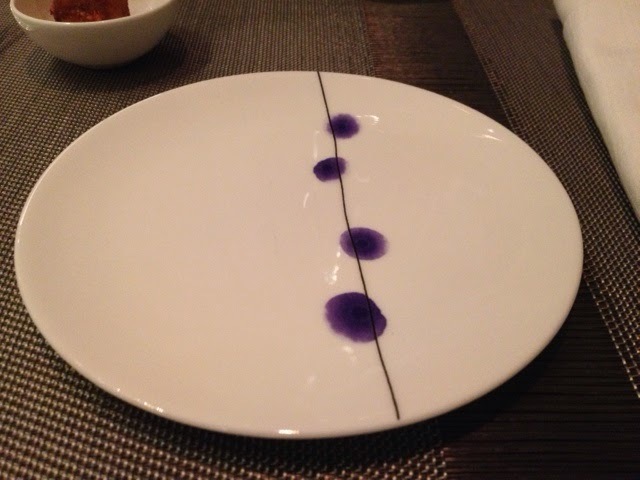 I just loved the whole dish. I was intrigued by the smoked beef carpaccio because it was served with semi dry pears, a bit of red chili and parmesan crisps with green leaf variety. The lemon puree brought a tang that was a surprising as it was delicious. I commended Chef for his use of pears. It worked exceptionally well. 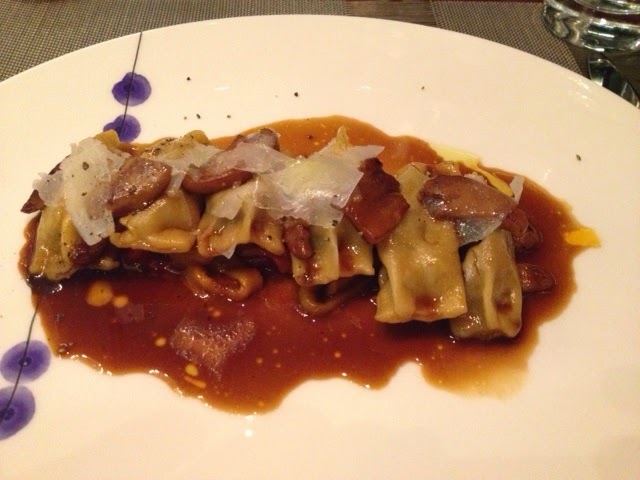 I chose my main based on the interesting filling of the agnolotti with oxtail. It tasted superb. It is always going to be difficult to create an exciting dish in terms of color when you use beef jus, but the bed of red capsicum played its part in adding color to the dish. The topping of it with Sardinian percorino cheese brought a gentle bite to the agnolotti. Furthermore, the capsicum effused the dish with a hint of sweetness, which really the taste buds in a wonderful manner. In addition, the porcini mushrooms were beautifully cooked. Finally, the portion size was absolutely perfect, rounding off very tasty dish. Dessert was indulgent and decadent. My waitress recommended the Chocolate torta with ricotta on a pistachio base served with canned peaches and olive oil ice cream. I was blown away by the way this was presented and the colors were a feast for the eyes. 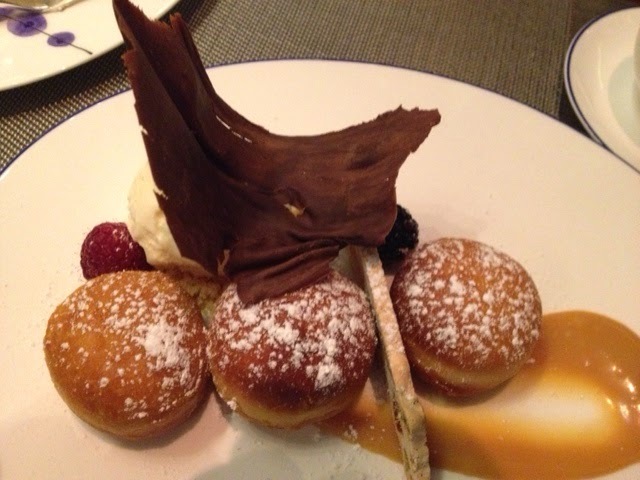 I was then surprised by Chef Harris who also sent the Bombolini with fillings of cream, chocolate and strawberry with vanilla ice cream and caramel sauce. Rich without being too heavy. I liked it. The service was flawless. I can only describe it in juxtaposing terms: slick but soulful, professional but warm and engaging without an uncomfortable familiarity. My waitress also possessed a product knowledge that made her service of the most complete I have ever experienced. She unwittingly summed up the service when she said: "I heard that if you love your job, you never have to work a day." Her passion for what she does was undeniably tangible. 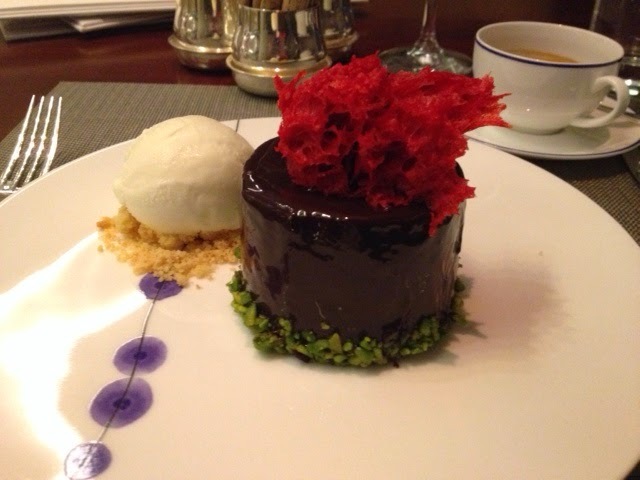 In summary, Aqua was one of my most loved and memorable dining experiences in Abu Dhabi. The food was outstanding and the service bar-raising. Asking what could have been done to make this experience better would be like asking how could Pavarotti have done a better interpretation of Nessun Dorma!